Eduardo Galeano, Memory of Fire. Wilfrido D. Nolledo, But for the Lovers. le thi diem thuy, The Gangster We Are All Looking For. Jamaica Kincaid, A Small Place. Jessica Hagedorn, The Gangster of Love. Marianne Villanueva, Ginseng and Other Tales from Manila. Bienvenido Santos, The Scent of Apples. Frances Chung, Crazy Melon and Chinese Apple. Barbara Jane Reyes, Poeta en San Francisco. Reginald Dwayne Betts, Shahid Reads His Own Palm. Al Robles, Rapping With Ten Thousand Carabaos in the Dark. Ntozake Shange, for colored girls who have considered suicide/when the rainbow is enuf. Sesshu Foster, City Terrace Field Manual. Adrian Castro, Cantos to Blood and Honey. Nick Carbo, Secret Asian Man. Oliver de la Paz, Names Above Houses. Brandy Nalani McDougall, The Salt-Wind: Ka Makani Pa'akai. dg nanouk okpik, Corpse Whale. Julia de Burgos, Song of the Simple Truth. Jack Agueros, Sonnets from the Puerto Rican. Juan Felipe Herrera, 187 Reasons Mexicanos Can't Cross the Border: Undocuments, 1971-2007. Audre Lorde, The Cancer Journals. Lee A. Tonouchi, Living Pidgin. Lisa Linn Kanae, Sista Tongue. Pati Navalta Poblete, The Oracles. Theresa Hak Kyung Cha, Dictee. 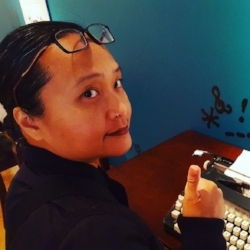 Barbara Jane Reyes is the author of To Love as Aswang (Philippine American Writers and Artists, Inc., 2015). She was born in Manila, Philippines, raised in the San Francisco Bay Area, and is the author of three previous collections of poetry, Gravities of Center (Arkipelago Books, 2003), Poeta en San Francisco (Tinfish Press, 2005), which received the James Laughlin Award of the Academy of American Poets, and Diwata (BOA Editions, Ltd., 2010), which received the Global Filipino Literary Award for Poetry. She is also the author of the chapbooks Easter Sunday (Ypolita Press, 2008), Cherry (Portable Press at Yo-Yo Labs, 2008), and For the City that Nearly Broke Me (Aztlán Libre Press, 2012). Her fifth full-length poetry collection, Invocation to Daughters, is forthcoming from City Lights Publishers.